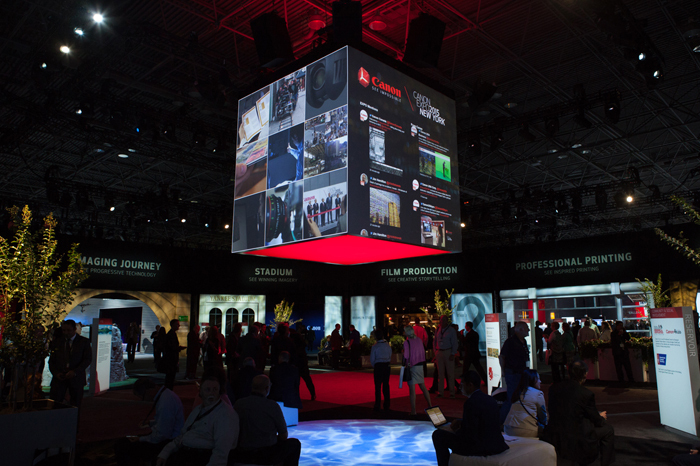 New York (November 5, 2015) – Every five years Canon presents its four-city global expo, and once again WorldStage provided the technology giant with AV support at New York City’s Javits Convention Center, the Expo’s only North American stop. Canon Expo 2015 New York brought together the company’s most powerful products, cutting-edge innovations and inspirational ideas across a range of markets. The three-day event spotlighted all of Canon’s product lines and previewed future technology concepts and applications for an eager public audience. Hired by digital marketing agency Dentsu America, WorldStage furnished AV support for portions of the Expo, including the walk-through tunnel, central hub area and the zones devoted to the imaging, industrial and home markets. 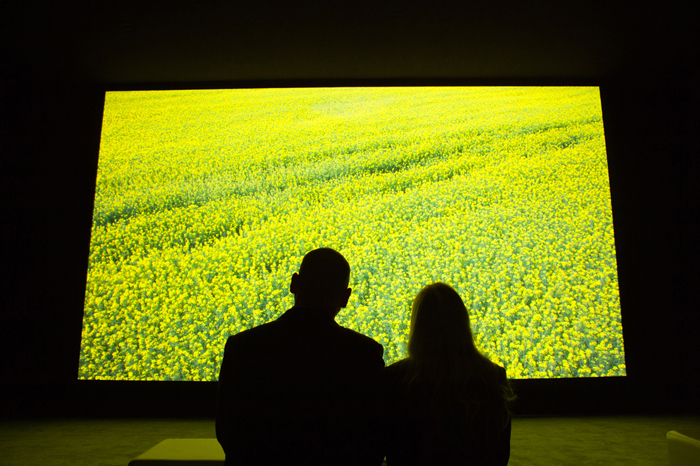 David Rome was in charge of the expo’s multimedia content for Dentsu America. The Canon Tunnel ushered visitors into the expo and funneled people past walls, 30 feet apart, that acted as projection surfaces displaying product-related content. WorldStage supplied Christie HD14K-M Series projectors with content playing on Brightsign players; audio was delivered by a multi-channel Meyer powered sound system. The Tunnel led to the Hub of the Expo; all of Canon’s market zones radiated from this central point. Suspended above the center of the Hub was the Cube, a 16×16 cube-shaped display. The Hub marked the first deployment of WorldStage’s new Christie Boxer 4K30 30,000-lumen video projectors. The 4K Boxers showcased product content as well as graphical keynote content dispersed to the screens. The Cube was driven by 4 channels of Dataton WATCHOUT, two Apple Mac Mini computers for the keynote content and two nodes of the Viz140, WorldStage’s proprietary social media visualizer, which was used to capture and display live tweets. On the audio side, WorldStage provided sound system based on Yamaha consoles and D&B speaker systems. For the other areas, WorldStage provided a wide variety of audio, video and control gear required to support the broad spectrum of exhibit requirements at Canon Expo. Large flat-screen monitors were supplied in HD and 4K resolutions supported by two dozen 4K and HD networked Brightsign players. For the many projection screens, WorldStage provided Panasonic HD projectors with exotic ultra-wide angle lenses as well as more Christie Boxers to create stunning 4K displays. For one area, a wall of thin-bezel monitors was used to recreate a security operations center, with WATCHOUT providing the multi-stream video feeds. At WorldStage John Ackerman and Alexis Durso were the project managers and Chris DeMott the site manager.